This is the percentage of overweight or obese dogs in America. More than half of the dogs in this country are fat. Over 43 Million Fat Dogs. People can be very touchy when I bring up this subject. Maybe it's my approach - I'm a very direct person. I don't do the softly, softly thing. I usually just say something along the lines of "How come Petsy's so fat?" Gasp! Utter shock and disbelief - did he really just ask that? They stumble over their words. I can see them physically trying to come up with an explanation, and at the same time trying to justify in their own heads something they've been denying for a while, even though it's shockingly obvious. "She's just big boned." "She's actually small for her age." "I don't think he's that big." "The vet says he's fine." "Oh, there's just more of him to love." It seems that people really don't like hearing that their dog is fat. Do they think it's a judgment call on them? Here they are, feeding Petsy a few extra treats every now and then, giving them a little extra food at meals times. Or maybe sharing a little bit of the sandwich they are having for lunch. They are feeling really good about how much they are loving their dog. Until, that is, I come along and tell them their dog is fat. Maybe I should be a little easier on some people. 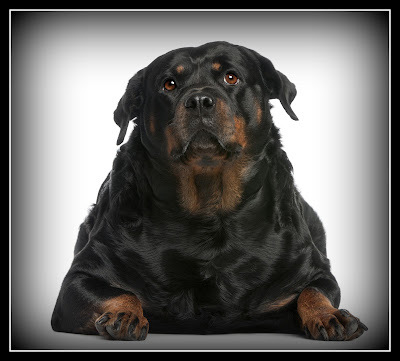 A recent study showed that 22% of dog owners did not realize that their dog was either overweight or obese. I think this is due to the fact that so many dogs are fat. When we try to compare Petsy with another dog, we can't get a real perspective. Just because there's a fatter dog at the park doesn't mean that your dog isn't overweight! We're not getting a true picture of how our dogs should look. In a recent vet visit with my own dogs, I was told, "They look a little skinny." My reply was, "You must see a lot of fat dogs." In my opinion, what it comes down to is that we think that food equals love, and that by cutting back on their food we are somehow being mean. Nothing could be further from the truth. We are actually doing a disservice to our dogs and setting them up for a miserable end to their already too short lives. Dogs have tendency to be stoic. They try not to show us that they're in pain. Our fat dogs will suffer for a long time before we, as their supposed caretakers, may even find out how much they are hurting. Many fat dogs suffer from joint pain, a fact which could easily be resolved by following a proper diet and exercise regime. Conditions such as type 2 diabetes, osteoarthritis, heart disease, and kidney disease are on the rise in our canine community - all brought about by obesity. Wake up, people. You're feeding your dogs to death. Leave a comment. Let me know your thoughts. Great post man! As a trainer I deal with this issue everytime I get a new client it seems. I have gotten rather good at telling people their dogs are morbidly obese and need to lose weight NOW, while still sounding polite. Sometimes I dont WANT to be polite, but such is the way of things. It's awesome you are speaking out on this, as so many people fail to realize the health issues THEY are causing for their dogs. Keep it up man, I love your blog!